Product prices and availability are accurate as of 2019-04-14 12:10:50 BST and are subject to change. Any price and availability information displayed on http://www.amazon.co.uk/ at the time of purchase will apply to the purchase of this product. 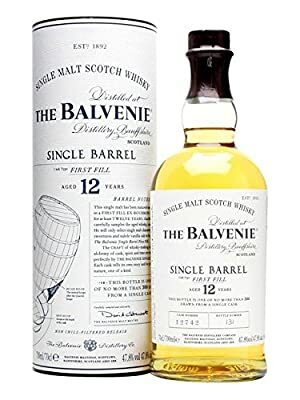 Released in 213, Balvenie's Single Barrel First Fill was matured in first-fill bourbon casks for at least 12 years before bottling. These are limited edition bottlings, with each bottle being one of no more than 3 drawn from a single cask. Each is also hand-numbered and labelled with the cask reference number. A deliciously creamy, vanilla-rich whisky from Balvenie.